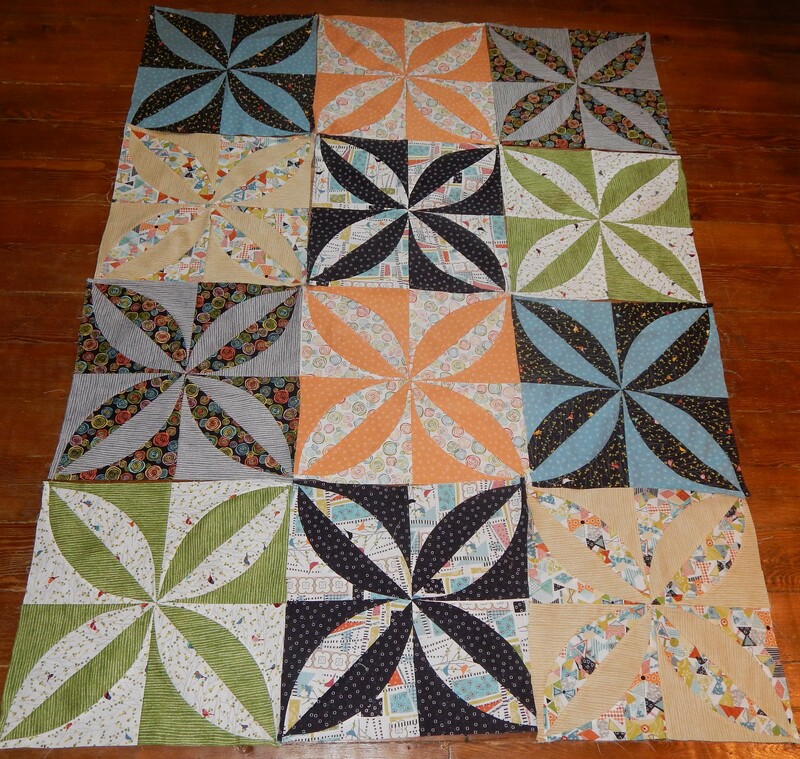 I finished piecing the Interplay blocks . I need to decide on a final layout before I sew them all together. Sometimes it is hard for me to see what they really look like until I take a pictures. For some reason I get a more objective view in a picture. I will trade the peachy blocks with the lightest blocks ….. they actually are not as light as they show in the picture but I think the balance will be better with them in the center. 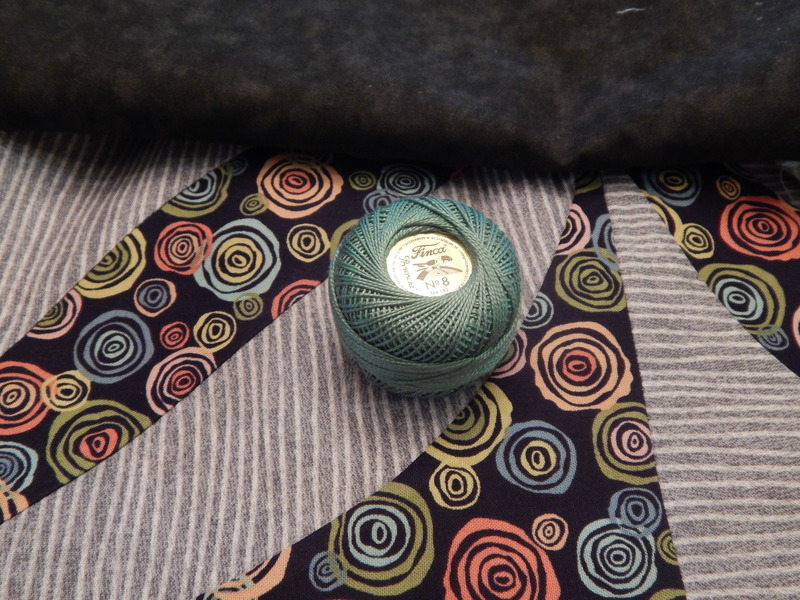 The mottled black at the top of the picture is the backing fabric and the thread is #8 perle cotton. I will do big stitch hand quilting on this. 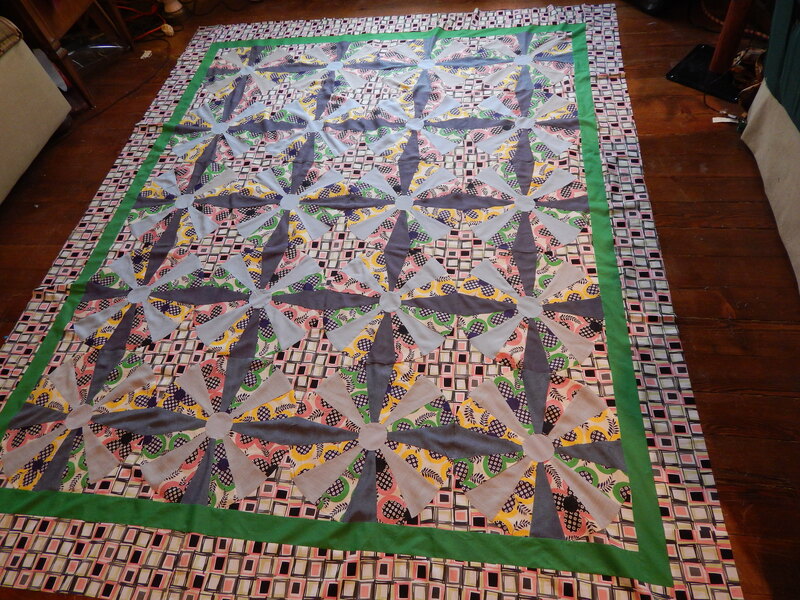 Now that I am nearly done with the piecing (my absolute least favorite part) I am going to let this one sit for a few days while I think about what quilting design I want to use. I should have it done in a few days. Teddy was upset because he didn’t get his picture taken today. 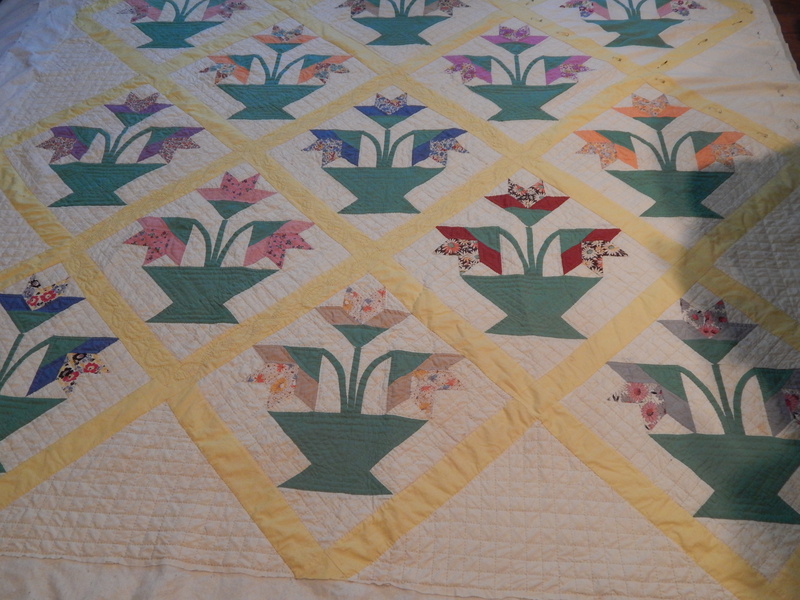 This entry was posted in Quilts and tagged hand quilting, interplay, Quilting, Quilts. Teddy is so cute. I just found your blog recently. I love what you do to someone else’s treasures. Great choice of the circle fabric for the backing. I need to look for that fabric. Thanks! I just love Teddy! You can tell he has a huge personality! Five quilts going — that’s our boy! Now if it were six, I would worry. The variety keeps it fun. I am glad I didn’t include the one I haven’t worked on for over a year!! Me too!!!! 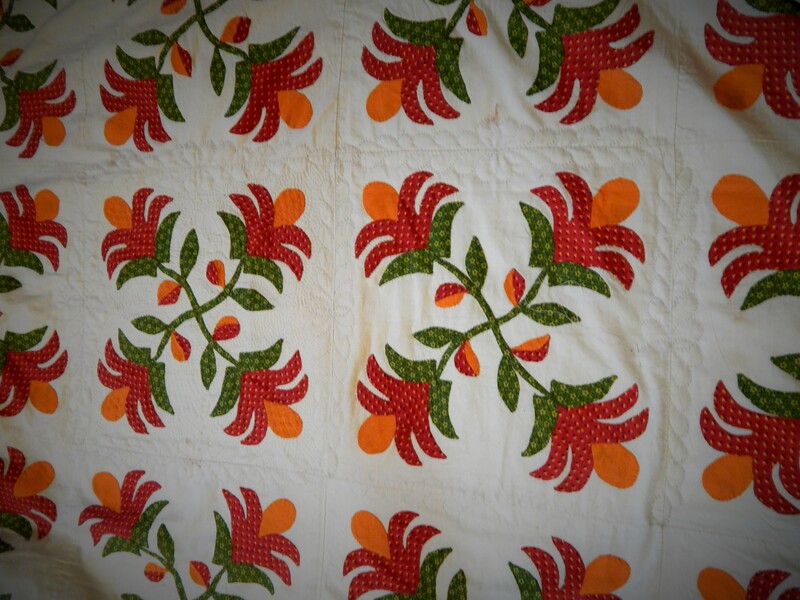 Between the stunning beautiful quilting and gorgeous gardens…….ahhhh…….just to spend a day would be such a ‘gift’. Teddy is a cutie! All the wonderful quilts you are working on. Enjoy seeing the progress you are making on each of them. I often use a camera too. 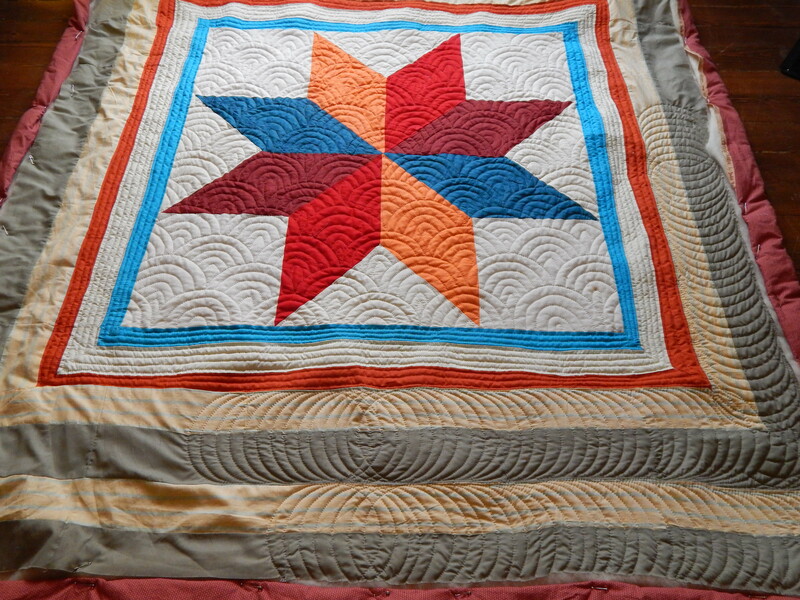 It really helps to see the whole quilt and assess the values. I am working on a very special tee-shirt quilt right now and the camera has also helped me get far enough away to see the quilt artistically and not just emotionally – does that make sense? Love your work. I wish I could quilt as fast as you do. makes total sense to me! I certainly can relate to the camera comment regarding value. I had a top all together and took a picture to show a friend and immediately saw a block that that stuck out like the proverbial sore thumb. I ‘unsewed’ it and swapped it out with another in another place, but took a picture before I sewed it back in. MUCH better. TIM… I’m in awe of what you are able to accomplish in such a short span of time! Wonderful stitching! Teddy looks very handsome in his pictures! Have you told him he has a fan club here? Thanks! I am going to rearrange and photograph again before I sew them together…..I really just hate to have to unsew….I always seem to get in too much a hurry and nick the fabric. I am in awe! Do you ever sleep? 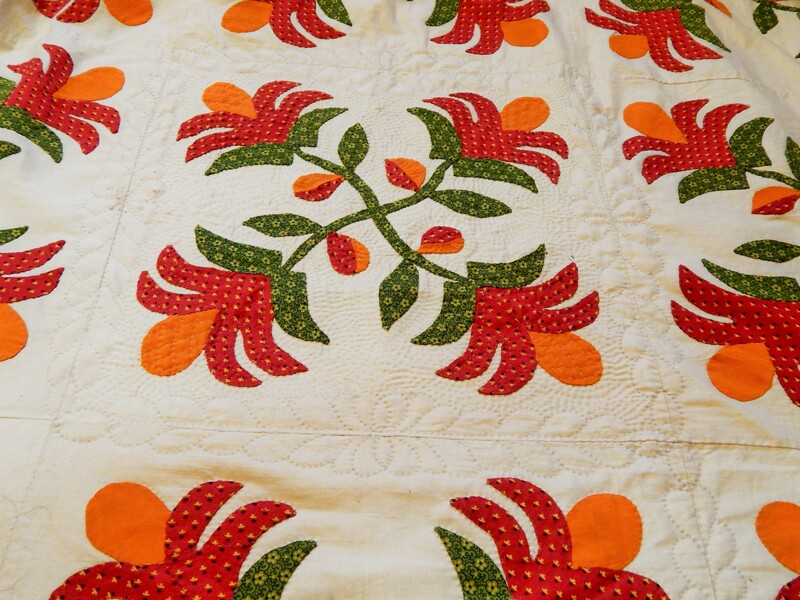 Quilts and flowers have this one thing in common .. That no matter how many times you view them they never lose their beauty!! So, you’re not planning any down time in the next 6 months or so…? You certainly do have a lot on your plate. I agree with your thoughts on the paler blocks in Interplay; it’s hard to see the melon slices because the contrast isn’t so strong. Dogs are so honest, aren’t they? 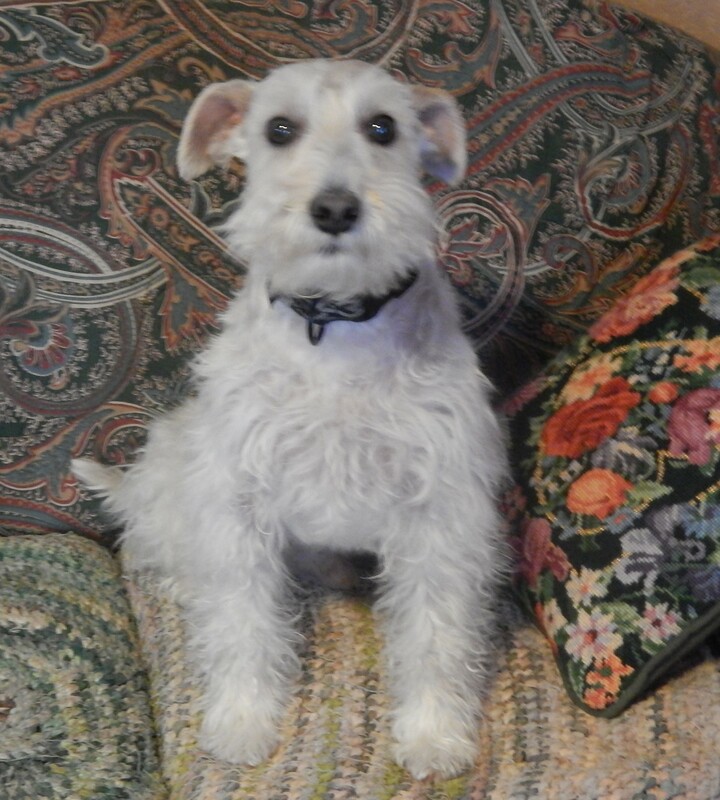 Teddy is the cutest – he reminds me of a child’s storybook I had called “Teddy the Terrier”, have you seen it? Wow, that is a lot on your plate. Have fun with all of it.. Thanks 🙂 I really do have fun! I know what you mean about taking pictures. I often take pictures of projects. Not sure why I can “see” them better that way. I hadn’t thought about that but I do know that I see things in flower photos that I didn’t see while I was taking the photo. I’m going to take part of the quilt apart and change it.